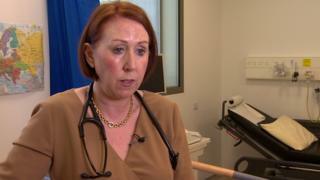 Image caption Dr Susan Connolly said the levels of obesity in Northern Ireland are "frightening"
Northern Ireland's obesity levels are shocking, according to a cardiologist working in the Western Health Trust. Dr Susan Connolly was speaking ahead of a new programme at the South West Acute Hospital in Enniskillen. Our Hearts, Our Minds aims to help people reduce the risk of heart attacks and strokes by becoming more active, stopping smoking and eating better. Dr Connolly said people here had much more unhealthy lifestyles than in some other parts of the UK. Obesity had become a "social norm", she added. BMI and obesity: Where are you on the UK fat scale? "One in five of the population smokes, which is much higher than in England, the majority of us are overweight or obese, our diets are poor and we don't know how many calories we are eating," said Dr Connolly. "We are obese and we don't even know we are obese. "We don't move enough, it's all quite frightening." Your browser does not support this lookup. To measure your waist, find the bottom of your ribs and the top of your hips and wrap a tape measure midway between these points. Breathe out naturally before taking the measurement. Your BMI is [bmi_result] which is in the [bmi_category] category. BMI is a standard way of measuring if people are a healthy weight for their height. For most adults 18.5 to 24.9 is the healthy range. Your BMI is [comparative] the average of [bmi_score] for a [gender_singular] in your age group ([user_age_group]) in [user_country]. About [percent]% of [gender_plural] in your age group in [user_country] are overweight, obese or very obese. In all parts of the UK, the majority of the adult population is overweight, obese or very obese, according to the latest national surveys. In [region], the figure is about [percentage]% of [gender_plural]. The information you've given us indicates you could be underweight. There can be health risks associated with a low BMI such as anaemia, osteoporosis, a weakened immune system and fertility problems. This is not a medical diagnostic tool so don't panic if this isn't the result you were expecting to see. If you're concerned about your weight, or your health in general, speak to a healthcare professional such as your GP. You're in the healthy range which is great. Research shows that having a healthy BMI can reduce your risk of serious health problems, such as type 2 diabetes, heart disease, stroke and some cancers. But not all people with a BMI in this range have a lower risk. Other factors such as smoking, high blood cholesterol or high blood pressure will increase your risk. If you're of Asian descent you have a higher risk of heart disease and diabetes at a lower BMI and waist circumference. A healthy BMI for you would be 18.5-23. We're more likely to gain weight as we get older so to stay a healthy weight you may need to make small changes to your diet or your activity levels as you age. The information you've given us indicates you are overweight. Research shows that a BMI above the healthy range can increase your risk of serious health problems, such as type 2 diabetes, heart disease, stroke, and some cancers. A healthy BMI for a person of your height would be 18.5-24.9. If you're of Asian descent you have a higher risk of heart disease and diabetes at a lower BMI and waist circumference. A healthy BMI for you would be 18.5-23. Losing even a small amount of weight, if sustained, can have a big impact. For most people changing your diet is by far the best way to lose weight. Activity can help you maintain your target weight, and can have other health benefits, but increasing activity alone is not nearly as effective as diet at helping you shed the pounds. Even small changes like reducing portion sizes or choosing lower calorie snacks and drinks can help you lose weight or stop putting it on. The information you've given us indicates you're in the obese category. Research shows that having a BMI in this range will significantly increase your risk of serious health problems, such as type 2 diabetes, heart disease, stroke, and some cancers. There's lots of support available to help you make changes, either to lose weight or to stop putting on weight. The information you've given us indicates you're in the very obese category. If you are concerned, or would like to find out more, speak to your doctor or GP. If you are ready to make lifestyle changes, there is lots of support available. BMI is not the only way of measuring whether you are a healthy weight. Doctors say that carrying too much fat around your belly can increase your risk of health problems. Excess fat in this area can stress internal organs - even if your BMI is in the healthy range. We calculate BMI using the standard formula of a person's mass in kg divided by the square of their height in metres (kg/m2) and display it to one decimal place. Where a user's data is entered in imperial units, we first convert to metric and then carry out the BMI calculation. Dr Connolly's views were borne out by a Department of Health survey for 2017-18, which found that 37% of people in Northern Ireland were overweight, and 27% were obese. People were making an effort to lose weight - but not always successfully - 40% of men and 47% of women had changed their eating habits to try to lose weight. The survey found that lack of willpower was the main obstacle to successful weight loss. About a quarter of children were also found to be overweight. The Enniskillen programme is being delivered as part of the transformation agenda and is for patients living with vascular disease, and for people identified as "at risk" of developing heart disease. It is the first of its kind in the UK and is based on research carried out in Imperial College, London. During its 12 weeks, a multi-disciplinary team including a nurse specialist, physiotherapist, dietician and psychologist supported by a consultant cardiologist will work alongside the patient and their partner or relative. At the end of the programme, both the patient and their partner will get feedback on how successfully they have changed their lifestyle and other risk factors such as their blood pressure and cholesterol. Dr Connolly said the research was very clear - that getting a sedentary person to move even a little can make a huge difference to their health. "The patient has to find something they enjoy doing, whether it is dancing, walking, swimming," she said. "If they enjoy doing it, they'll keep doing it."